Tuesday – Guitar, ukulele, beginning piano and computer recording. Chris has been a musician since he was a kid. Both of his parents came from the classical tradition, so there was always music in the home. “The only weird thing about my musical perspective starting out was that my parents’ vinyl collection consisted of classical composers and 3 Beatles records. I thought that was the norm in every household. I was wrong.” Before long, Chris, with the help of his older brother, started to discover the enormous world outside classical music. Chris started with piano, and then he joined the school band in 6th grade. His band experience included clarinet, the drumline and even drum major. Chris had also started playing guitar just before high school, so he had the chance to add his chops to the jazz band as well. 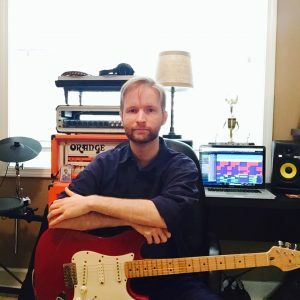 With guitar being Chris’ biggest passion, he brought it up the mountain to Appalachian State University to study under the direction of Dr. Douglas James in the guitar ensemble. There, Chris studied classical finger style, and with Andy Page, jazz guitar. Rock and pop was still in his heart, however, so he frequently submitted projects to his recording studio professor at ASU (Scott Wynne) focused on those genres. When Chris returned to Atlanta in 2008 – the first time since childhood – he worked at a few recording studios around town, and he played in various bands at venues such as the old Masquerade (Heaven and Hell), Smith’s Olde Bar, Vinyl at Centerstage and many others. He has always wanted to get back into the academic side of music, so now he’s teaching private lessons at Firehouse. With a focus on music appreciation, he just wants his students to enjoy music as much as he does.